His Eminence Archbishop Melchisedek was born Thomas Alexander Pleska in 1942. His father, Alexander Peter Pleska, was born in Byelorussia near Brest-Litovsk, and immigrated with his parents to the U.S. in 1925. His mother Johanna (Eugenia Stachuk) Pleska was born in Cleveland, Ohio of Ukrainian immigrant parents, and was baptized in St. Theodosius Cathedral. At the time he was growing up in Dayton, OH, there was no Orthodox parish present, and he and his sister received their Christian formation in local Protestant parishes. They were taken to the “Russian” Church in Cleveland for important Holy Days, and other visits. 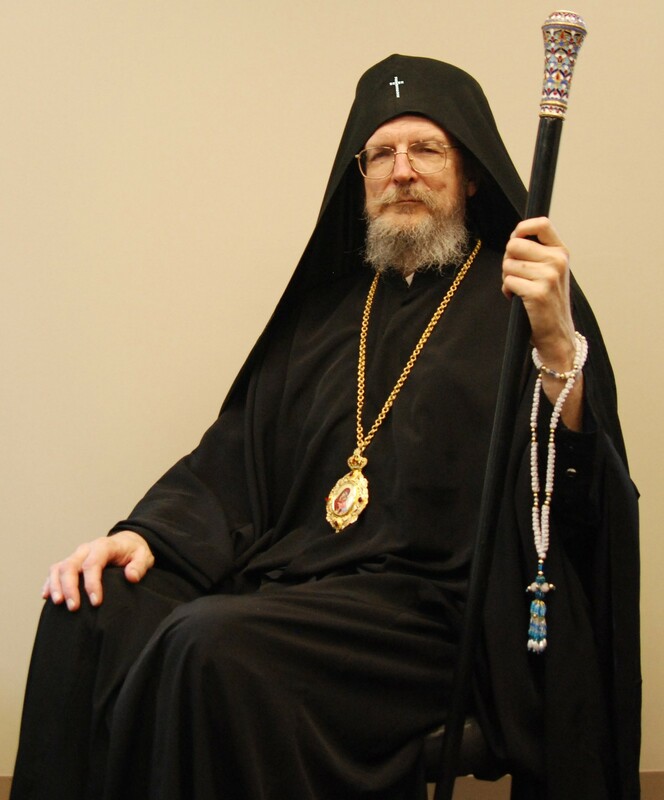 It was as an adult that Archbishop Melchisedek describes himself as becoming a member of the Orthodox Church at Christ the Savior Church in Cincinnati, OH, under the pastorship of Fr. Daniel Rentel. After High School, Thomas Pleska first attended the University of Michigan School of Music, and then Miami University in Oxford, Ohio, where he completed a B.A. in Philosophy, with aspirations to eventually receive a doctorate and teach. After graduating, he entered the business world, first in a stock brokerage and later in real estate. In the early 1980s, he made the decision to earn a Master of Divinity degree at St. Vladimir’s Seminary. During his studies, under the deanship of Protopresbyter John Meyendorff, Thomas was encouraged to consider ordination. Through several encounters with monastic spiritual fathers, including Elder Dionysios of the Simono-Petras Monastery on Mount Athos and Archimandrite Dimitry Egoroff, a monk of Old Valaam, he also made the decision to take the monastic tonsure after ordination. Thomas Pleska was ordained to the Diaconate in 1985, on the feast of the Entrance of the Theotokos into the Temple, November 21, by His Grace, Bishop Job. In 1986, on the Feast of the Annunciation, March 25, he was ordained to the Priesthood by His Beatitude, Metropolitan Theodosius. In the fall of 1986, Fr. Thomas accepted the position of Instructor of Dogmatic Theology at St. Tikhon’s Seminary. During his time teaching at St. Tikhon’s, he served as chaplain at the Holy Myrrhbearers Women’s Monastery in Otego NY, and as interim pastor at Holy Trinity Church in Pottstown, PA, St. Michael in Old Forge, PA, and St. Basil in Simpson, PA. It was also at this time that he made his acquaintance with the Elder Sophrony and his monastery in Essex, England. From 1989 to 1998, Fr. Thomas served as rector of Saints Peter and Paul Church in Meriden, CT. In 1998, Fr. Thomas traveled to Greece, where he served first at the Monastery of the Holy Cross, an international women’s community in Thebes. In 2003, he was transferred to serve as chaplain at the women’s monastery of St. George the Great Martyr, and to serve his own brotherhood at the Monastery of the Dormition of the Theotokos in Petras. In 2004, he was tonsured to the Great Schema, taking the name Melchisedek, and raised to the rank of Archimandrite. On Saturday, June 27, 2009, His Beatitude, Metropolitan Jonah and the members of the Holy Synod of Bishops of the Orthodox Church in America consecrated Archimandrite Melchisedek Bishop of Pittsburgh and Western Pennsylvania at St. Alexander Nevsky Cathedral, Allison Park, PA.
Bishop Melchisedek was elevated to the rank of Archbishop on Friday, March 21, 2014.